The Page of Wands as with all of the Court Cards can be some of the most difficult to read in a spread. This is because not only can they symbolize certain events or issues relating to your life, just as the other cards do; they can also symbolize a person. Pages are linked to children so if you have in any in your life at the moment then you may recognize one that is always active and energetic and often comes in late form play. This child can be male or female and Is always full of fun and likes to be the centre of attention. If children do not focus in your life then this card often symbolizes the receipt of great good news that will cheer you up. A young person may be about to offer you some help and any family issues may be drawing to a close. The Page of Wands is a nice card to have in your spread and can act as the creative spark or flash of inspiration that sets you off to go and learn something new. The Page of Wands summary. 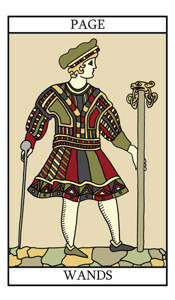 The Page of Wands Card illustration.